It is very kind of the Bishop of Limerick and Killaloe, Bishop Kenneth Kearon, and the Dean of Saint Mary’s Cathedral, Limerick, to invite me here this afternoon to share some of my thinking about how we are commemorating 1916 this year, and how we might reflect on the events 100 years ago that shaped the Ireland we live in today. I lecture in Church History in the Church of Ireland Theological Institute on a course that leads both to ordination in the Church of Ireland and to a master’s degree in theology from Trinity College Dublin. As a canon of Christ Church Cathedral, Dublin, I am concerned with the way the commemorations of 1916 look like forcing the cathedral to close on Easter Day, the most important day in the Christian calendar. For the first time since Christ Church Cathedral was built almost 1,000 years ago in 1030, it looks like the central act of worship in calendar of the Church is not going to take place in the cathedral, and all because of a peculiar quirk in our calendars. If this were to happen in Mecca or Moscow, under Saudi laws or Soviet diktats, you could imagine the righteous anger throughout the Christian world. The calendars of the state and of our schools, popular events and television programmes, are revolving around events marking the centenary of the 1916 Rising. The Easter Rising began on Monday 24 April 1916, which was neither Easter Day nor in March. But this year’s main centenary events are taking place on Easter Day, Sunday 29 March 2016. The most important day in the Christian calendar has been taken over so that on Easter Day most churchgoers in Dublin are not going to get to the church or cathedral of their choice in the city centre. Despite representations from the Churches, a lockdown in Dublin is going to keep people away from Christ Church Cathedral and many more churches. But this is not the first time that the Christian message of Easter has been hijacked for political purposes. We revel in our myths, so who is going to point out that neither Sinn Féin nor the IRA took part in the events of Easter Week, or that Patrick Pearse did not lead the rising? The three organisations named in the Easter Proclamation are the Irish Republican Brotherhood, the Irish Volunteers and the Irish Citizen Army, and the IRA was not formed until 1917. Instead, modern Irish nationalism begins with the revival of the Irish language. The leading figures in that revival include Dr Douglas Hyde, the son of a Cork-born Church of Ireland rector, Canon Arthur Hyde, and Dr Eleanor Hull, who wrote hymns such as Be thou my vision – although it is often forgotten that she was born in England and died there too. 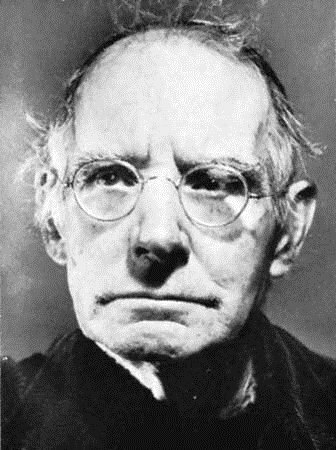 The new nationalism found its expressions in the Abbey Theatre, founded by Lady Gregory, WB Yeats and George Russell (AE), in the poetry of Yeats and the plays of Sean O’Casey – all members of the Church of Ireland. Since 1916, the leaders of the Easter Rising have been transformed into either working class heroes or the personification of what it is to be Green, Gaelic, Catholic and Irish. But the truths of history are different. Pádraig Pearse was born Patrick Henry Pearse, the son of James Pearse, a Birmingham Unitarian who came to Dublin with the Victorian arts-and-crafts movement. Pearse was never a member of Sinn Féin or the IRA, and despite romantic portrayals linking him to Connemara, his mother was born in Dublin. Other myths surrounding Pearse include one that he was “President of the Provisional Government,” a post that was held instead by Thomas Clarke. Thomas Clarke was not born in Ireland but in an army barracks on the Isle of Wight, where his father was a soldier in the British Army. Thomas MacDonagh had a middle class education in Rockwell College, Co Tipperary, and was a lecturer in English in UCD. In 1912, he married Muriel Gifford, a member of a well-known Church of Ireland family in Dublin. Éamonn Ceannt, an accountant, was born Edward Thomas Kent, the son of an officer in the Royal Irish Constabulary. James Connolly was born in Edinburgh, and spoke with a Scottish accent all his life. After joining the British Army at the age of 14, he spent seven years with the army in Ireland. In 1890, he married Lillie Reynolds, a member of the Church of Ireland who was born in Co Wicklow. Joseph Mary Plunkett was the son of Count George Noble Plunkett, and his distant cousin, Sir Horace Curzon Plunkett, was a prominent lay member of the Church of Ireland and a Home Rule MP. The poet was educated by the Jesuits at Belvedere and Stonyhurst, a public school in Lancashire. Hours before his execution, he married Grace Gifford, who, like her sister Muriel MacDonagh, had been born into a Church of Ireland family. So, two of the seven signatories were not born in Ireland, one was the son of an Englishman, one had served in the British army, one was the son of an RIC officer, one was born in a British army barracks, one was a titled aristocrat who went to an English public school, and at least three married women who were born into the Church of Ireland. These backgrounds were similar to those of many prominent figures on the Republican side after 1916. For example, Liam Mellows, later executed in 1922 during the Civil War, was born William Joseph Mellows in an army barracks in Manchester, and his father was born in a British army barracks in India. While the Rising was being planned, Arthur Griffith and Sinn Féin favoured establishing a form of dual monarchy linking Ireland and Britain, similar to the dual monarchy in the Austro-Hungarian Empire, and Sinn Féin did not support the Rising. 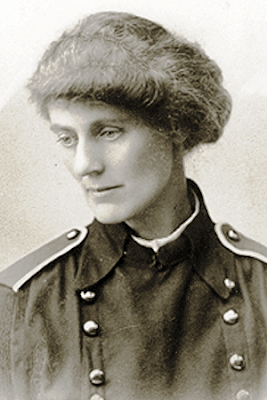 Many of the women who had prominent roles in the Rising were members of the Church of Ireland: Countess Markievicz, the suffragette and a leader of the Irish Citizen Army, was born Constance Georgine Gore-Booth in Buckingham Gate, London, the daughter of Sir Henry Gore-Booth of Lissadell House, Co Sligo. 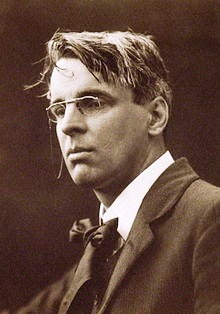 She and her younger sister, Eva Gore-Booth, were childhood friends of Yeats. Dr Kathleen Lynn, a founding member of the Irish Citizen Army who commanded the rebel garrison in City Hall in Easter Week, remained a pious member of the Church of Ireland until her death in 1955. Indeed, the first informal meeting to form the Irish Citizen Army took place in Trinity College Dublin in the rooms of the Revd Robert Malcolm Gwynn. He attended Saint Bartholomew’s Church, Ballsbridge, until his death in 1962, and is buried in Whitechurch Churchyard. One of his brothers, Brian Gwynn, was father-in-law of the late Archbishop George Simms. Through their mother, the Gwynns were grandsons of William Smith O’Brien (1803-1864), the exiled 1848 revolutionary who was born in Dromoland Castle, Co Clare, and was MP for both Ennis (1828-1831) and for Co Limerick (1835-1849). In 1914, members of the Church of Ireland were among the most prominent organisers of the Howth gunrunning. Erskine Childers, a cousin of the Bartons of Glendalough House, sailed the Asgard into Howth. The organisers included his wife Molly Childers, Sir Roger Casement, Alice Stopford Green and Mary Spring Rice – all Church of Ireland members, as were many of those waiting for them on the pier, including Countess Markievicz, Douglas Hyde, Harry Nicholls and Darrell Figgis. Edward Conor Marshal O’Brien (1880-1952), skipper of the Kelpie, one of the yachts involved in the gunrunnings, was a member of the Church of Ireland from Limerick and a first cousin of the Gwynn brothers. He was a grandson of William Smith O’Brien. 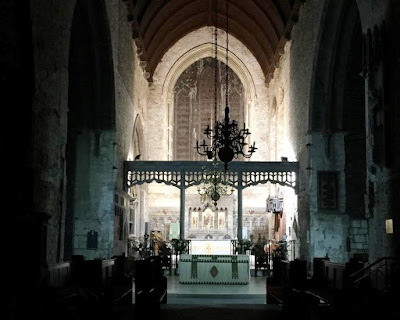 The equally dramatic Kilcoole gunrunning in Co Wicklow was organised by the skipper of the Chotah and the King’s Surgeon in Ireland, Sir Thomas Myles (1857-1937), who was baptised in Saint Michael’s Church of Ireland parish church in Limerick. He was the son-in-law of the Revd George Ayres (1825-1881), as a Church of England clergyman, and his brother, the Very Revd Edward Albert Myles (1865-1951), was Dean of Dromore. 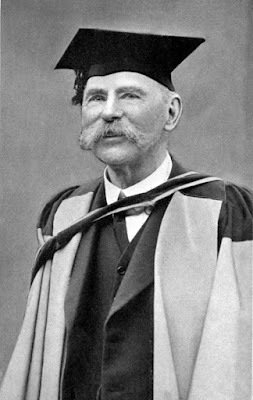 Sir Thomas Myles was knighted at King Edward VII’s coronation and after World War I began he joined the Royal Army Medical Corps and became an honorary surgeon to the King in Ireland. In the weeks to come, considerable attention will focus on the 15 leaders of the Rising who were executed. The youngest of the 15 leaders who were executed after the Rising was Edward ‘Ned’ Daly (1891-1916), who was the commandant of the Dublin 1st battalion, stationed at the Four Courts, in 1916. He was born at 26 Frederick Street (now O’Curry Street), Limerick, almost 125 years ago, on 25 February 1891, the only son among the 10 children of Edward and Catherine Daly. One of his nine sisters was Kathleen Clarke (1878-1972), wife of Tom Clarke, one of the seven signatories of the Proclamation and Freeman of Limerick. Kathleen Clarke was later a TD and Senator, and was the first woman and the first member of Fianna Fail to become Lord Mayor of Dublin (1939-1941). Apart from the 15 who were executed, research by Glasnevin Cemetery shows that 485 people were killed in the Easter Rising. The majority of these casualties were civilians, with 184 killed in Easter week. A quarter of those who were killed were soldiers (107), many of them Irish, while the rebel forces accounted for 16 per cent of deaths (58). Four per cent of the casualties were among the police (13). The non-combatants killed or murdered included the pacifist Francis Sheehy-Skeffington. Almost one in five of those killed was under the age of 19. The RTÉ broadcaster Joe Duffy tells the story of the 40 children killed in the Rising in his book, Children of the Rising. If we are going descend into the numbers game – and in the Lectionary readings tomorrow morning, Abraham is challenged by God to engage in the impossible task of counting the stars – then the historian Martin Maguire, who lectures in Dundalk Institute of Technology, has counted at least 45 Protestants – 21 women and 24 men – who were active in the Republican movement between 1916 and 1921. The small group of Protestant rebels held in Frongoch after the Rising included Arthur Shields, Ellet Elmes, Sam Ruttle of Tralee, and Alf Cotton of Belfast. The historian Senator Alice Stopford Green (1847-1929), who was closely involved in the Howth gunrunning, was born Alice Sophia Amelia Stopford in Kells, Co Meath. Her father, the Ven Edward Adderley Stopford, was Rector of Kells and Archdeacon of Meath, and her grandfather, Edward Stopford, was Bishop of Meath. Her niece, Dr Dorothy Stopford-Price (1890-1954), was one of the founding figures in Saint Ultan’s Hospital, Dublin. Later, she would contribute to the elimination of childhood tuberculosis in Ireland by introducing the BCG vaccine. The novelist Annie MP Smithson (1873-1945), who later became a Roman Catholic (like Constance Markievicz and some others), later took part on the Republican side in the Civil War. Seán Lester (1888-1959) from Carrickfergus, Co Antrim, became Secretary-General of the League of Nations (1940-1946) during World War II and was the father-in-law of Douglas Gageby, late editor of The Irish Times. Ernest Blythe (1888-1975), who is credited with government policies that may have saved the Abbey Theatre, was at one time the only Protestant cabinet minister. Maguire’s list does not include Edward Conor Marshal O’Brien (1880-1952), who was involved in the Howth and Kilcoole gunrunnings in 1914. He was a grandson of Wiliam Smith O’Brien, and his parents lived in Cahirmoyle, Co Limerick. He was an architect and he designed the People’s Hall in Kilmallock, Co Limerick. He died in Foynes, Co Limerick, in 1952. Martin Maguire gives particular prominence to the involvement in the 1916 Rising of Harry Nicolls (1889-1975) and Kathleen Emerson. Harry Nicolls was born in Derry but went to school in Mountjoy in Dublin and then went to TCD, and is “unique in being the only graduate of Trinity College Dublin who was an active republican rebel in 1916.” Both he and George Irvine went to Church in Saint Patrick’s Cathedral, Dublin, on Saint Patrick’s Day 1916 dressed in their Volunteer uniforms. When he was released from Frongoch, his ‘guarantors’ were his father and the Rector of Rathmines, the Revd EH Lewis-Crosby (1864-1961). It was a risky move for Lewis-Crosby, who also a guarantor for Ellet Elmes – he was also a chaplain to the Lord Lieutenant; later he became Dean of Christ Church Cathedral, Dublin (1938-1961). Later, Harry blamed the Dublin city manager, PJ Hernon, and a network of Knights of Columbanus for the fact that he was never appointed City Engineer, despite his ability and all because he was a member of the Church of Ireland. Kathleen Emerson (d. 1970), born Kathleen Holmes, was the widow of the Revd George Emerson – their marriage had lasted only a year. She was an early suffragette and campaigner for woman’s rights, and served two months hard labour in Holloway for her activities in 1912. Harry Nicholls and Kathleen Emerson were married in 1919. They lived out their final years in Portmarnock, Co Dublin, and then in Grafton Street, Dublin. He is buried in Powerscourt Churchyard in Enniskerry, Co Wicklow, where his gravestone records that he was a ‘1916 patriot and founder of the ILGOU’, the trade union for local government officials. If the myths surrounding 1916 are in danger of writing members of the Church of Ireland and their roles out of history, then we must also remember that more Irish soldiers – Catholic and Protestant – died at the Gallipoli landings in 1915 or at the Somme in 1916 than died in the Easter Rising. Sinn Féin was not involved in the Rising. Indeed, the party was in such disarray at the time that it was insolvent and unable to pay the rent on its Harcourt Street premises. Its leader, Arthur Griffith, was then a monarchist, advocating a dual monarchy for Britain and Ireland. It was not until late in 1916 that Éamon de Valera joined Sinn Féin, and the party almost split between its monarchist and republican wings at its 1917 Ard Fheis until a compromise motion was tabled favouring the establishment of an independent Ireland, leaving the people to decide between a monarchy and a republic. 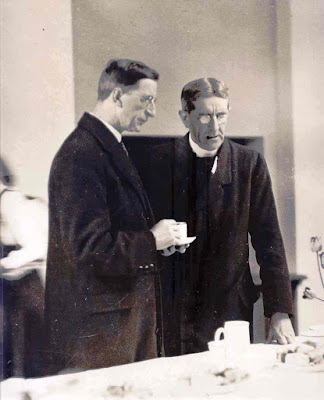 During the Civil War, Archbishop Gregg was arrested by Free State soldiers in a case of mistaken identity – he was a look-alike for Eamon de Valera. In 1922, after many Protestants were forced from their homes and some had been murdered in Co Cork, a delegation of southern members of the General Synod met Michael Collins and WT Cosgrave, and asked whether the government was “desirous of retaining” the Protestant community. The new government readily gave the assurances sought. Martin Maguire puts all of these Church of Ireland participants in the events surrounding 1916 “in the pantheon of Irish republicanism who were Protestant, [including] Wolfe Tone, Robert Emmet, Thomas Davis, John Mitchell and William Smith O’Brien.” He might have added to that list Douglas Hyde, who became the first President of Ireland under the 1937 Constitution. We could argue into the late night about whether the Easter Rising in 1916 had any legitimacy, whether it destroyed all hopes for a Home Rule that had already been conceded and that might have held out the hope for an eventual reunification of the island, whether it broke the heart of John Redmond, whether the real spur to the War of Independence was not the Easter Rising but the execution of the 15 leaders in the week that followed, whether it laid the foundations for a sectarian or discriminatory state, and so on. The ‘What Ifs’ of history are multiple, but they do not create or re-create facts. Perhaps, as Martin Maguire suggests, too much can be made of the role of the armed struggle in bringing about independence. The creation of Dáil Éireann in January 1919 may have been more decisive an event in Irish history. My grandfather was in the Royal Dublin Fusiliers in World War I. He came back to Ireland in 1916, in the weeks immediately after the rising. He was suffering from malaria that he had picked up in Thessaloniki, malaria that eventually drove him made, and he died a sad and lonely death within five years. In those five years, the atmosphere in Ireland had changed, ‘All changed, changed utterly,’ such a terrible beauty was born, that when he was buried in a small Church of Ireland churchyard in north Co Dublin, his widow, my grandmother, made no mention of his war record on his gravestone. But no matter what our views, our heritage, our family memories or our politics are, there are some positive aspects from 1916 that we can all share as part of our heritage. The Republic guarantees religious and civil liberty, equal rights and equal opportunities to all its citizens, and declares its resolve to pursue the happiness and prosperity of the whole nation and of all its parts, cherishing all of the children of the nation equally, and oblivious of the differences … which have divided a minority from the majority in the past. We can be thankful that the Civil War was short and that the only lasting legacy today is the indefinable differences between two large political parties. Despite that Civil War, major steps towards guaranteeing democracy on this island include de Valera’s decision to take his supporters into the Dáil, the democratic handover of the reins of government in 1932, which had the support of the Civil Service, the police and the army, and the Constitution, which despite its weaknesses at the time, has become a robust guarantee of our democratic process, and of the principle separation of the government, the legislature and the courts. Few other European societies have avoided the rise of a fascist far-right in large numbers, few other European societies have been without a civil war for almost a century, and a few other European democracies enjoy a process where every major constitutional change must be approved by the people in a plebiscite or constitutional referendum. Yes, we have been riven by petty sectarianism, discrimination and a legacy from 1916 that saw many families divided. But I am thankful for the democracy have today. Despite its weaknesses and its failures, it remains one of the most robust and stable democracies in Europe. (Revd Canon Professor) Patrick Comerford lectures in the Church of Ireland Theological Institute. 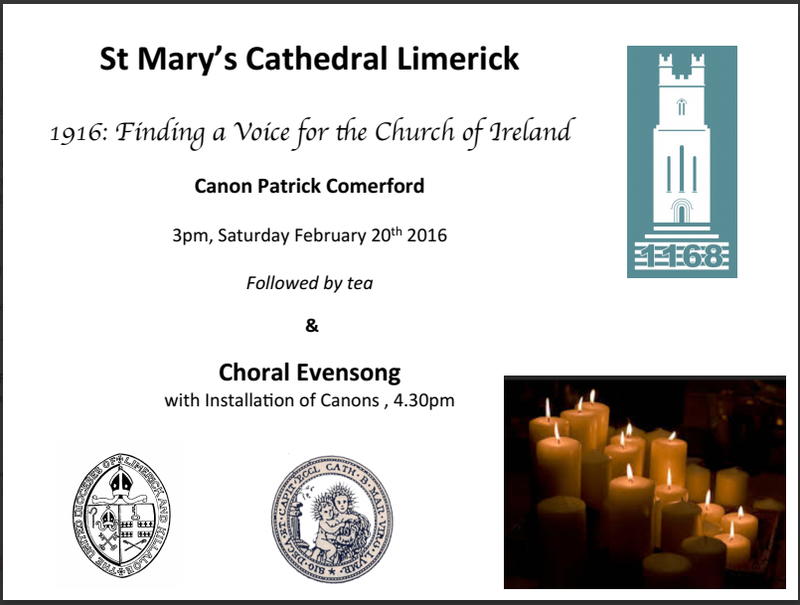 This lecture was given in Saint Mary’s Cathedral, Limerick, on Saturday 20 February 2016. Saint Mary’s Cathedral, Limerick, will be the venue at 3 pm for a talk on 1916 – Finding a Voice for the Church of Ireland by Canon Patrick Comerford from the Church of Ireland Theological Institute. The Deputy Mayor of Limerick, Cllr Maria Byrne, and the Catholic Bishop of Limerick, Most Revd Brendan Leahy, will be present. The lecture will be followed by Choral Evensong at 4.30 pm, during which Canon Jane Galbraith will be installed as treasurer of the Joint Chapter of the Cathedrals and Canon Ruth Gill as Prebendary of Inniscattery. Tomorrow morning Canon Comerford will be the preacher at the Eucharist in Saint Flannan’s Cathedral, Killaloe, Co Clare. Saturday afternoon’s lecture: follow this link. This afternoon [20 February 2016], I am speaking in Saint Mary’s Cathedral, Limerick, about the Easter Rising in 1916, about the role of members of the Church of Ireland 100 years ago, and how the Rising has shaped our understanding of national identity today. Johnson’s biographer, James Boswell, tells us that Samuel Johnson made his famous pronouncement that patriotism is the last refuge of a scoundrel on the evening of 7 April 1775. Boswell assures his that Johnson was not indicting patriotism in general, only false patriotism. However, because he does not provide any context for how the remark arose, it is not known for sure what was on Johnson’s mind at the time. Some claim a place in the list of patriots, by an acrimonious and unremitting opposition to the court. This mark is by no means infallible. Patriotism is not necessarily included in rebellion. A man may hate his king, yet not love his country. A man sometimes starts up a patriot, only by disseminating discontent, and propagating reports of secret influence, of dangerous counsels, of violated rights, and encroaching usurpation. This practice is no certain note of patriotism. To instigate the populace with rage beyond the provocation, is to suspend publick happiness, if not to destroy it. He is no lover of his country, that unnecessarily disturbs its peace. Few errours and few faults of government, can justify an appeal to the rabble; who ought not to judge of what they cannot understand, and whose opinions are not propagated by reason, but caught by contagion.